The "Baylor Massacre" (also "Tappan Massacre") was a surprise British attack on September 27, 1778, against the 3rd Regiment of Continental Light Dragoons under the command of Colonel George Baylor during the American Revolutionary War. It occurred in the present-day town of River Vale, New Jersey. Of a company of 116 Continental officers and men, 69 were killed, captured, or wounded. The dead, all bayoneted, tallied 15. Two officers died, two were wounded. On September 22, 1778, ordered Maj. Gen. Sir Charles Grey, Maj. Gen. Lord Cornwallis, and Brigadier General Edward Mathew to mobilize troops in an effort to provoke Gen. George Washington into a battle, and as a diversion for a raid against a Patriot privateering base in southern New Jersey. After learning that Col. George Baylor had secured quarters for his troops, twelve officers and 104 enlisted men, in the barns of several farms on Overkill Road (now Rivervale Road), Cornwallis ordered Grey to pursue Baylor's troops. Around 11 o'clock on the night of September 27, 1778, British Major-General Charles Grey mobilized the 2nd battalion of light infantry, the 2nd regiment of grenadiers, as well as the 33rd and 64th regiments. Between one and three o'clock in the morning, six companies of light infantry under Major Turner Staubenzie and six companies of light infantry under Colonel John Maitland approached a small collection of farm houses occupied by around 100 men of a Virginia cavalry unit known as "Mrs. Washington's Guards". Maitland's detachment was used to cut off the night patrol, while Straubenzee's troops used their bayonets to maintain the element of surprise as they went from house to house, a tactic Grey used previously in the Battle of Paoli. At least 69 of the dragoons were killed, injured or taken prisoner. Eleven were killed outright; four were left and died of their wounds. Colonel Baylor, Major McLeod, and two other officers attempted to escape by climbing up a chimney. Baylor was wounded and captured—he died in 1784 from complications of the wounds incurred in the attack. McLeod was also mortally wounded in the attack. One of the other officers was killed and the other captured. After the attack, some of the injured were taken to the Reformed Church of Tappan in nearby Tappan, New York, which served as a prison and hospital. The 52nd (Oxfordshire) Regiment of Foot, which was nearing the end of its service in the American War, was also involved in this incident. The events were described as follows by General Hunter: "While at New Bridge we heard of their being within twenty-five miles of our camp, and a plan was laid to surprise them. We set out after dark, mounted behind dragoons, and so perfectly secure did the enemy think themselves that not even a sentry was posted. Not a shot was fired, and the whole regiment of dragoons, except a few who were bayoneted, were taken prisoner". The raid for which this attack was a diversion also included an attack on American forces that has been described as a massacre. On October 15, British troops executed a surprise attack on forces under the command of Kazimierz Pułaski in which 25 to 30 men were killed in what is known as the Little Egg Harbor massacre. In 1967, it was discovered that the bodies of six of the dead were buried in three abandoned tanning vats. The vats were from Haring's Tannery, which used to be on the site. The remains were identified by artifacts such as buttons and clothing remnants. 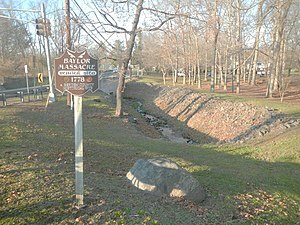 This became widely known because of a February 1968 report to the Bergen County Board of Chosen Freeholders, "1778 – The Massacre of Baylor's Dragoons". Facing suburban development, the burial site was made into a county park in 1972 with a dedication on October 15. The remains were reinterred within the park at that time. In memory of American soldiers killed during the Revolutionary War in the 'Baylor Massacre' on September 28, 1778. Lt. Col. George Baylor's 3rd Regiment of Continental Dragoons took quarters for the night on several nearby farms. Tories betrayed their presence to a British force who surrounded the Dragoons during the night. A number of Americans were killed or wounded after they surrendered. ^ Nelson, Paul David (1996). Sir Charles Grey, First Earl Grey. London: Associated University Press. p. 66. ISBN 0-8386-3673-X. ^ a b Clayton, W. Woodford; William Nelson (1882). History of Bergen and Passaic Counties, New Jersey. Philadelphia, PA: J. B. Lippincott & Co. p. 57. ^ Lee, Francis Bazley (1902). New Jersey as a Colony and as a State. The Publishing Society of New Jersey. p. 316. ^ a b c d e f "Skirmish Near Tappan". Rivington's Royal Gazette. 3 October 1778. Retrieved 2013-01-18. ^ "Tappantown Historical Society". Archived from the original on 2006-04-10. Retrieved 2006-10-06. This page was last edited on 1 April 2019, at 23:00 (UTC).